One of the major issues I had with this project was the poor condition of my house siding. The cedar siding was begging to check pretty bad. Another issue with my house was that in the 70’s it was built with 2X4 construction and lacks decent insulation. 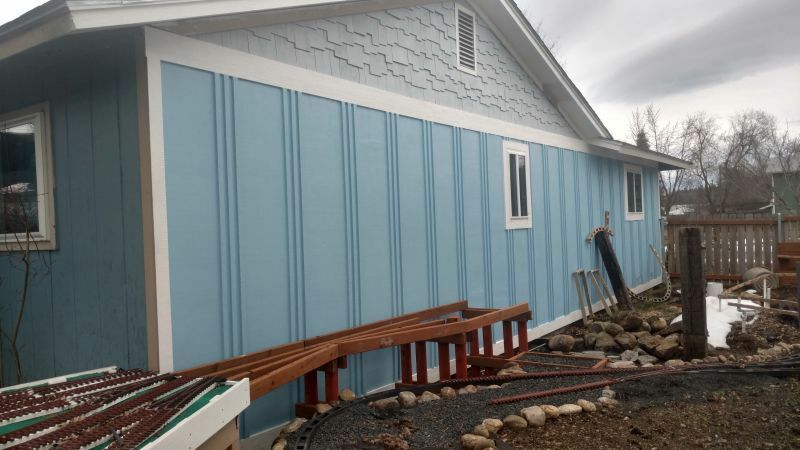 For years we have discussed new siding and adding insulation. The layout would be in the way of such a major project so it was time to bite the bullet and add 1” of foam insulation and new siding. We wanted to ditch the T-11 look and do something different. Our yard’s theme is rustic/old west. So Board and Batten seemed fitting. It also fits my 1880’s theme for the Railroad. So we sided this side of the house. 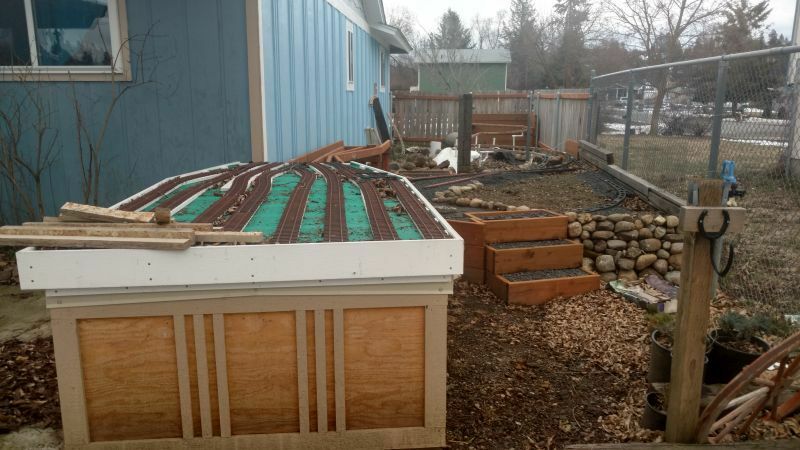 After the siding was complete, I could get into building the railroad in earnest. So the section next to the house and coming of the yard would be bench work. I wanted something attractive and fit the theme so I came up with the idea to make the bench work look like a pile trestle. The bents are made with treated peeler logs and pressure treated 2 X 4s. They rest on concrete pads. The top will be made with PVC boards and screen mesh materiel. 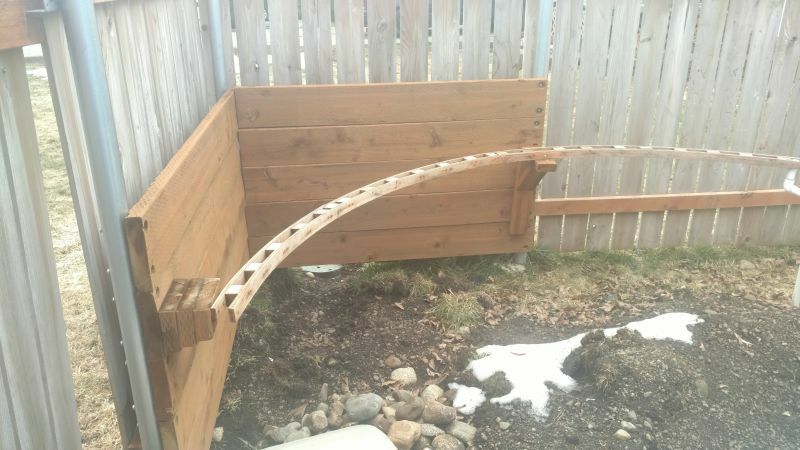 The rest of the railroad will be a cedar ladder system. 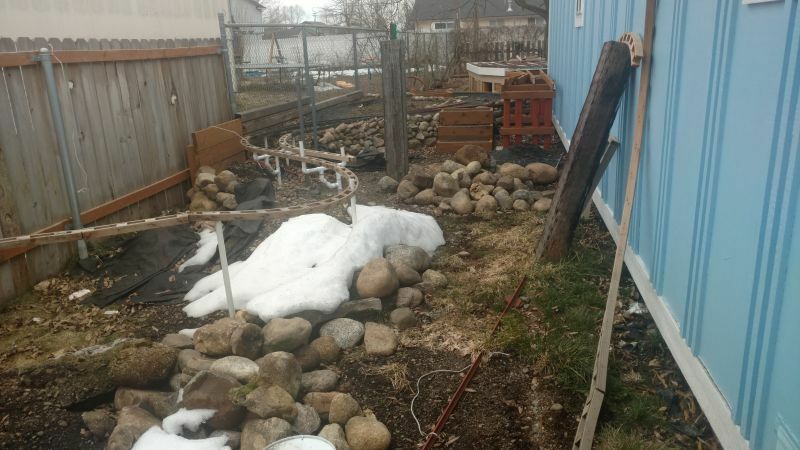 My soil won’t allow me to pound PVC into the ground. So I used a post hole digger and dug down about 18”. I then embedded the 1” PVC into concrete and screwed the ladder to it. Then I used geofabric as a weed block and to help build up rock retaining walls. I live on the world’s best supply of rounded cobble. So the retaining walls are made with native stone taken from a local famers field. I have about 1/3 of the rock work and dirt hauling done. As I was warned, Things on paper do not necessarily translate on the ground. That became apparent when the loop turned out to be bigger than I expected and no walk way was going to be possible. 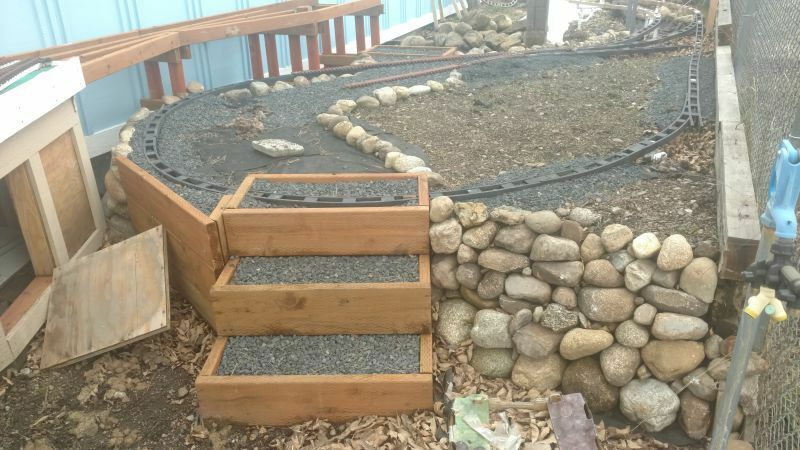 So I had to build steps and a walkway up and over the lower loop. This is where we left off in the fall. 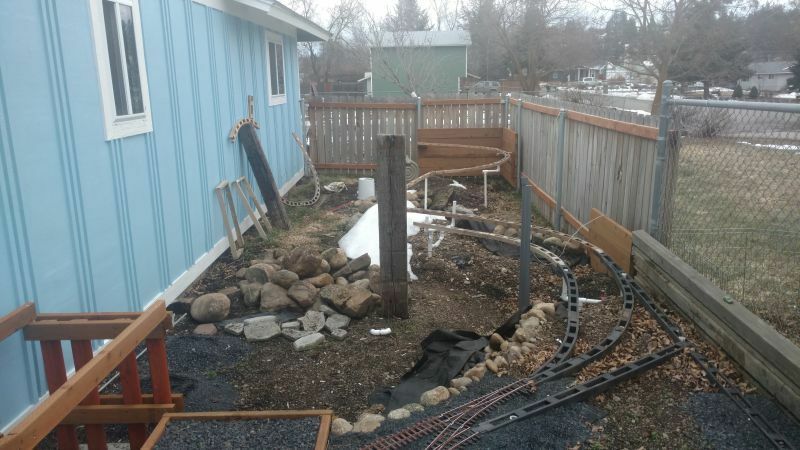 Now that the weather is turning I have cleaned the shop, the layout is almost free of snow, and I am ready to get to work. The first order of business is to get the bench work bents made and make up the last of the ladder. And the first challenge there will be to layout the benchwork for the wye. As soon as it dries out a bit I will pour the footings and finish installing the ladder. After that will be hauling a ton of rock and dirt. I have been given a few weeks extra time. It was supposed to be done by the second week of July for a club meeting. That has been bumped to the second week of August. But my birthday is July 29th. I want to run a train on my birthday. Stay tuned. Sean McGillicuddy Nice update .. the project is moving along!